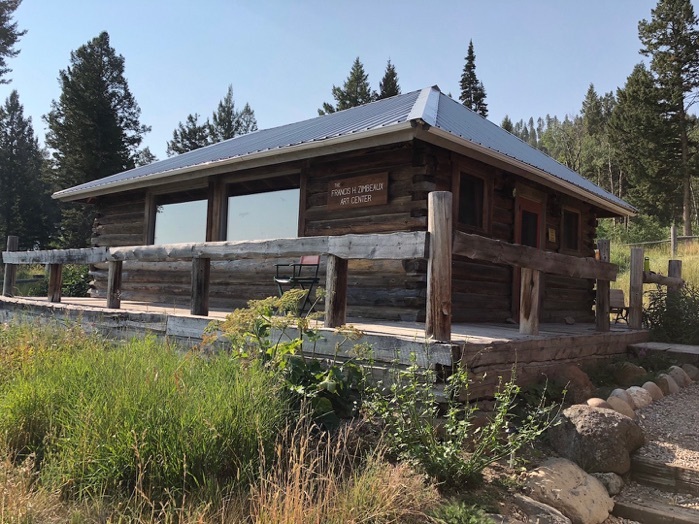 As sculptors we often find ourselves working in the realm of conflict and contradiction, and this project began as a paradoxical desire to produce a field guide that would defamiliarize Montana’s Centennial Valley in the greater West Yellowstone ecosystem. 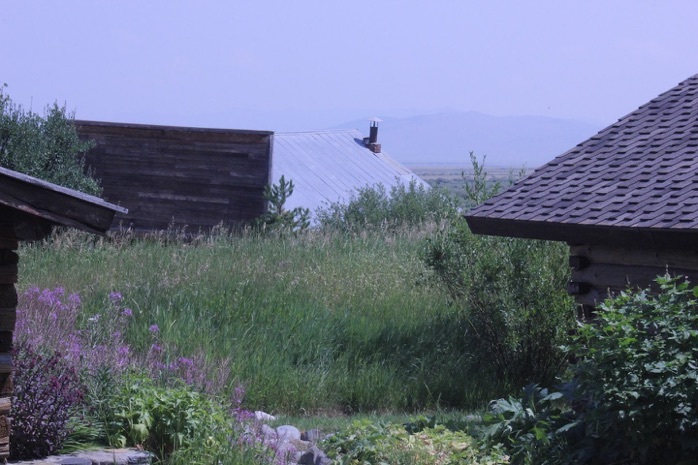 What if, instead of thinking of the Centennial Valley as some last vestige of a disappearing landscape, we could re-imagine it as something fresh and unfamiliar? Not something coming to an end, but something opening up to a new and different future? 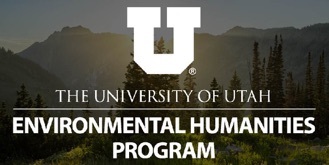 We were generously supported by the University of Utah’s Taft Nicholson Center for Art and the Environmental Humanities located in the heart of the valley, and found in this unique geographic corridor many important collaborative conservation efforts between ecologists, ranchers, and artists inspiring a holistic understanding of nature. 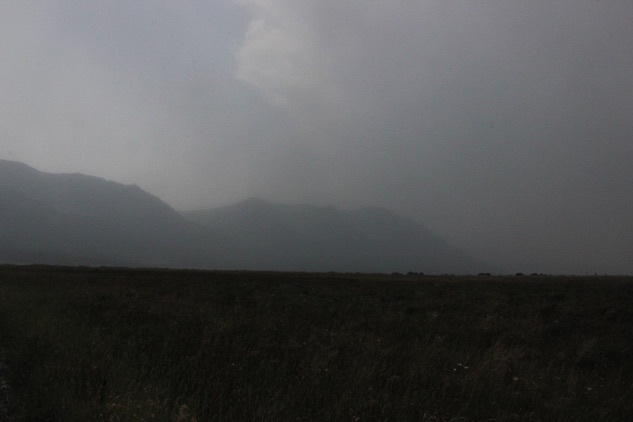 Ecology and art are both ways of accessing the world. Both are tools for producing new ways of thinking, for identifying and generating new relationships, and actively inventing the world we live in. To best take advantage of this opportunity we somewhat abandoned our heavily studio-based proposal favoring, instead, an immersion outdoors, venturing on hikes alongside the center’s faculty and graduate students, trying to lose our orientation in a new thick landscape, immersed in unforeseen connections. We took daily excursions, and along the way made material collections, drawings, and photographs. 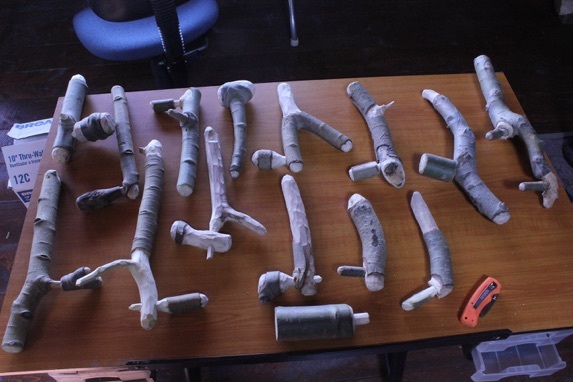 As sculptors, we are weary of adding more things to an already cluttered world, and the only tools we really brought were our pocket knives with the goal of repurposing found materials from the forest that could be returned to it. 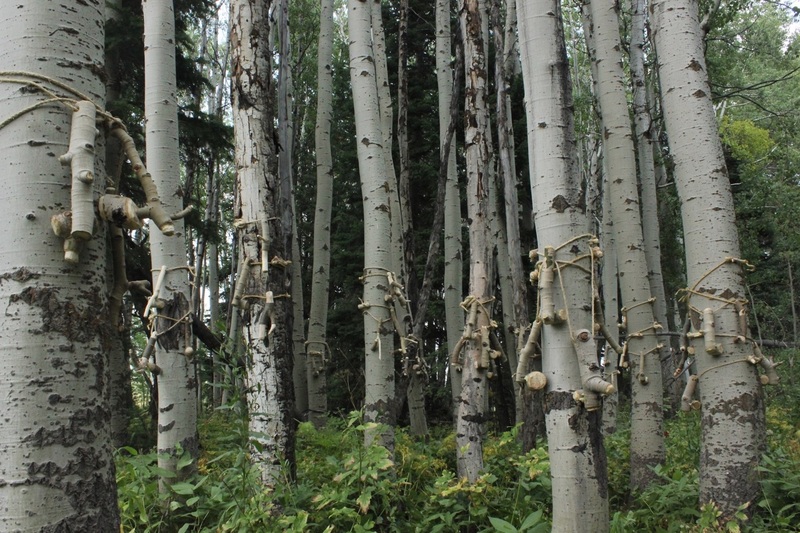 Our route to West Yellowstone was flanked by beautiful colonies of Aspen, and such stands are usually clonal- largely connected underground by their roots to form a rhizomatic superorganism with identical DNA. These networks suggest a kind of intelligence, a forest that communicates. 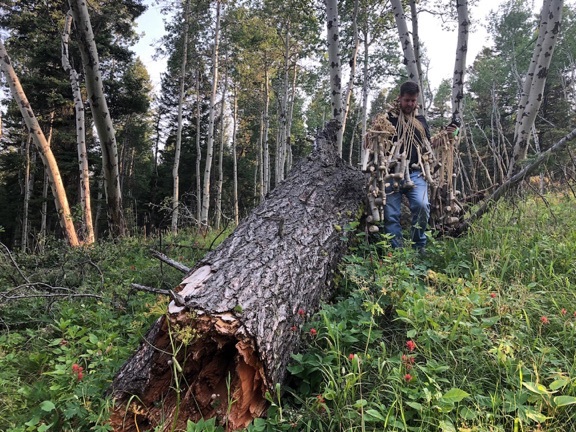 In fact, it’s speculated that the oldest living organism on the planet is a clonal colony of aspens just southwards in Utah that has continuously thrived for over 80,000 years, named pando, making it one of the oldest and heaviest living organisms. 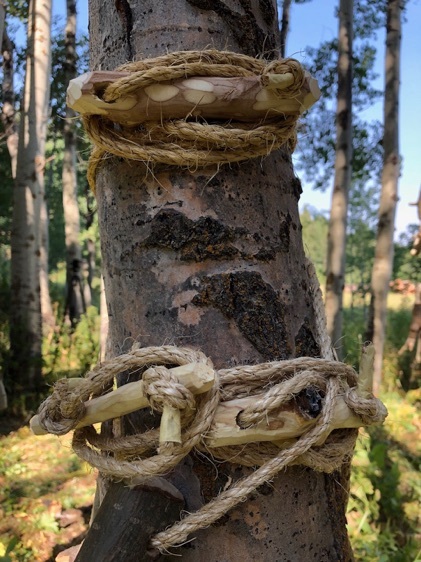 We learned of the beaver’s relationship with the aspens, which feed on their nutritious bark and use the wood as forage for dams, dispersing waterways and thus allowing ecosystems to flourish. 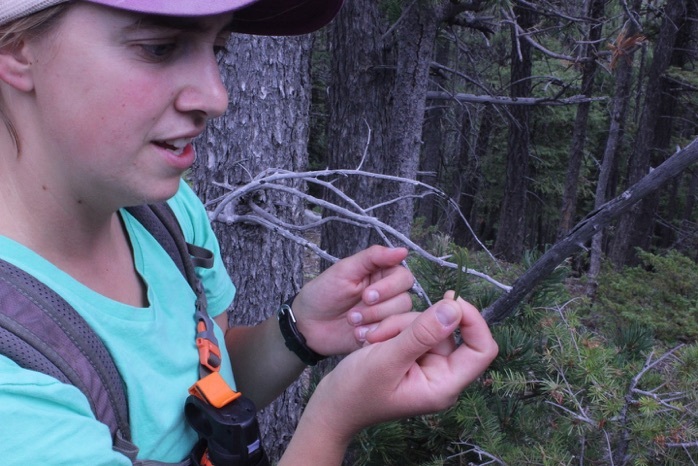 However, the extreme lack of apex predators has enabled populations of ruminating species to grow out of proportion, such as mule deer and elk. 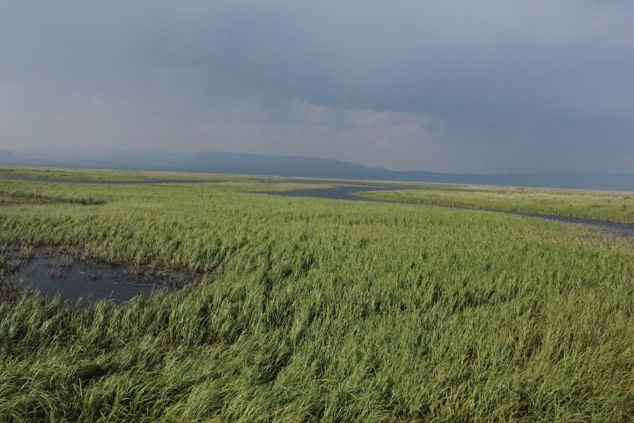 These ruminants love to feed on immature aspen, and the lack of new mature trees hastens the decline of the beavers, and the subsequent detriment of habitats. 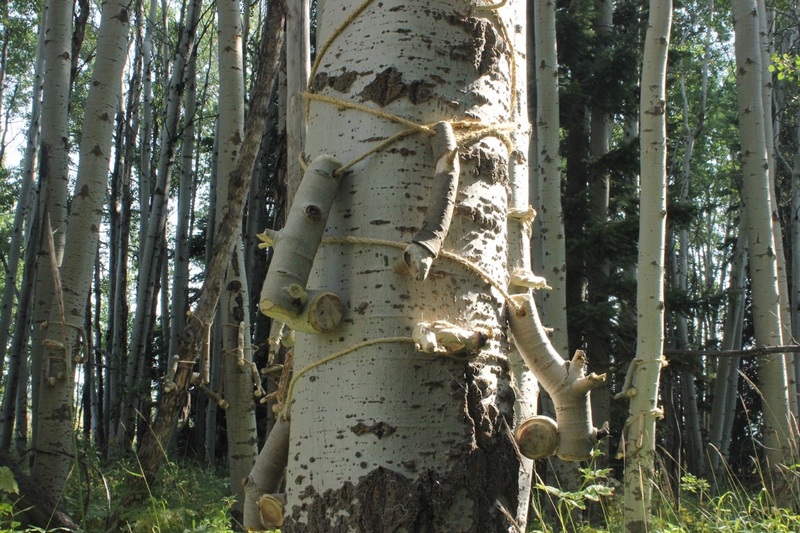 The aspen’s bark is unique for several reasons. The sunnier side produces a white powder that the tree uses as a sunblock, and which people can also scrape off for protection. The powder can also function as a yeast starter for baking. Its sap can be consumed like maple syrup. 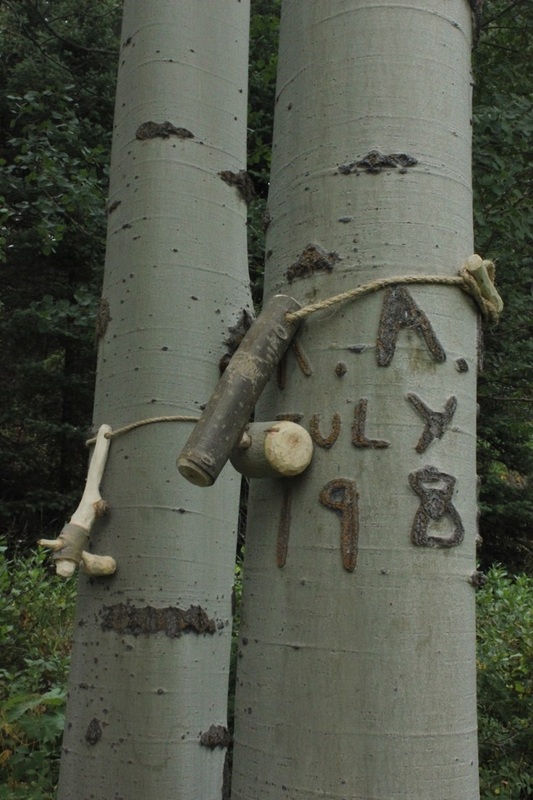 The greenish bark photosynthesizes, producing sugars even in winter, and makes the tree significantly resilient to forest fires. 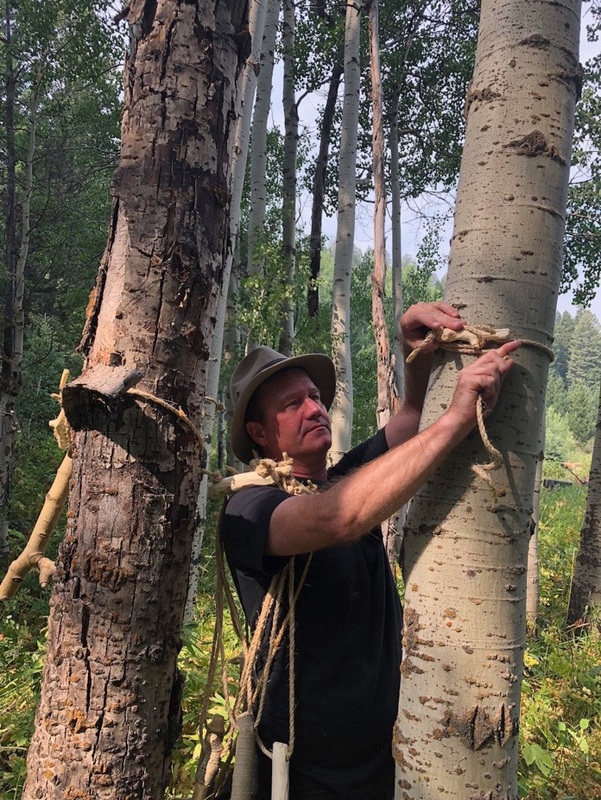 Aspens often grow in transition zones where meadows meet mountainsides, and are one of the first species to grow after a forest fire, making them a crucial element in habitat re-stabilization. However, the present lack of forest fires due to human prevention, when compounded with global warming, means that the forest fires that do occur are enormous, out of control, and devastating. 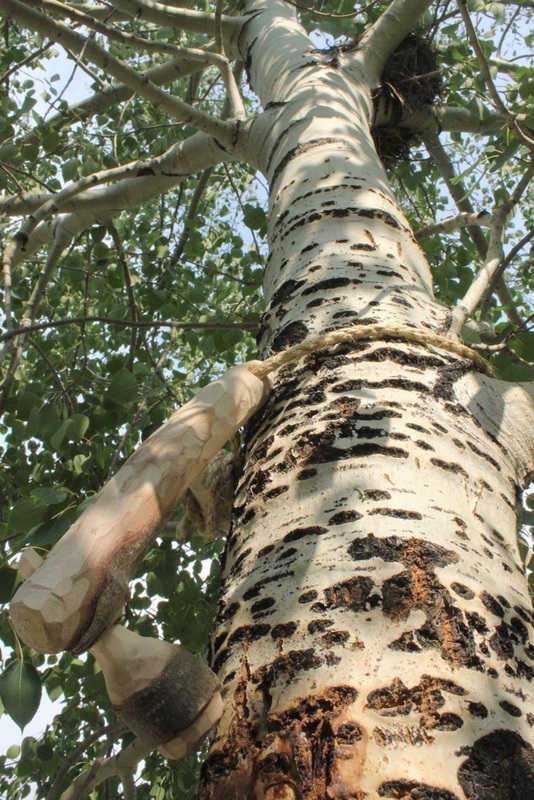 Our research led us to the sapsucker woodpecker, a species that thrives largely on aspens in a somewhat symbiotic relationship- extracting parasites from the bark for nutrients. Sapsuckers sometimes coat their prey in sap before dining, as if putting syrup on pancakes. We encountered them numerously, as well as their unique linear pecking patterns signified by distinct holes that begin in a linear horizontal or vertical series. Acoustically, its pecking starts with short repeated bursts that trail-off into longer more distributed bursts, resembling Morse code. In fact, the sapsucker uses its drumming to communicate. Our project is designed to engage these various interconnected valences of the Centennial Valley (rhizomes, aspens, sapsuckers, and beavers) with an austere aesthetic. 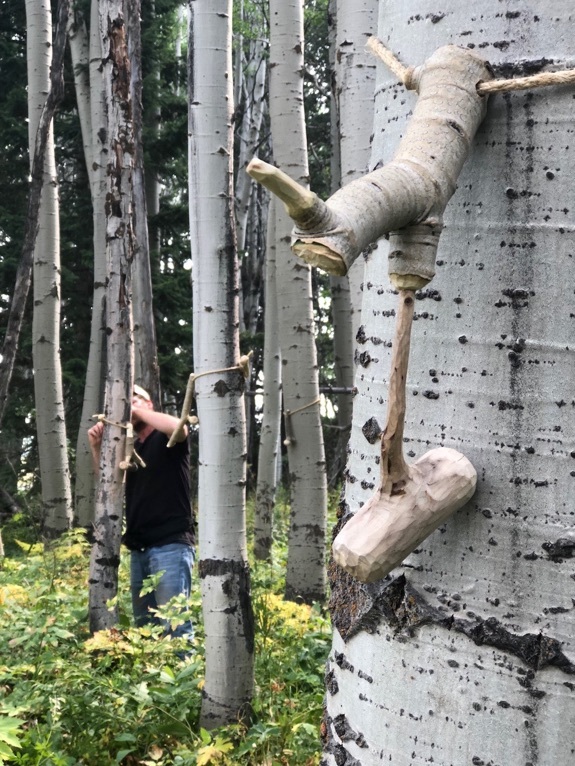 We sculpted fallen aspen branches into forms akin to door knockers, and installed hundreds of these knockers throughout multiple clonal colonies across the valley. 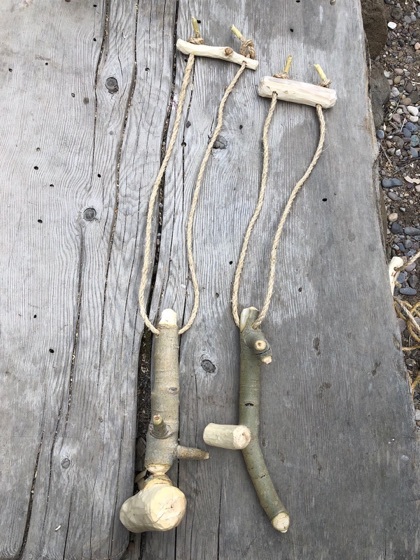 These knockers resemble and mimic the sapsucker, and are crafted by whittling, a democratic fabrication process that reminds of the beaver. The knockers have handles to afford gripping, making them tools and extensions of our hands. 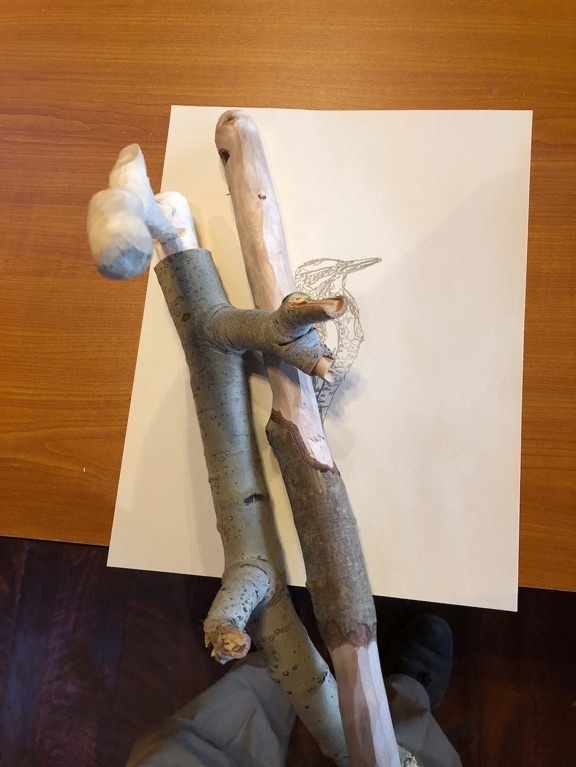 Whittling these branches afforded collaboration with the wood’s features and, akin to joint-disturbing tricksters, we dismantled branches at the joints and re-assembled them into new configurations to allow for a different movement. 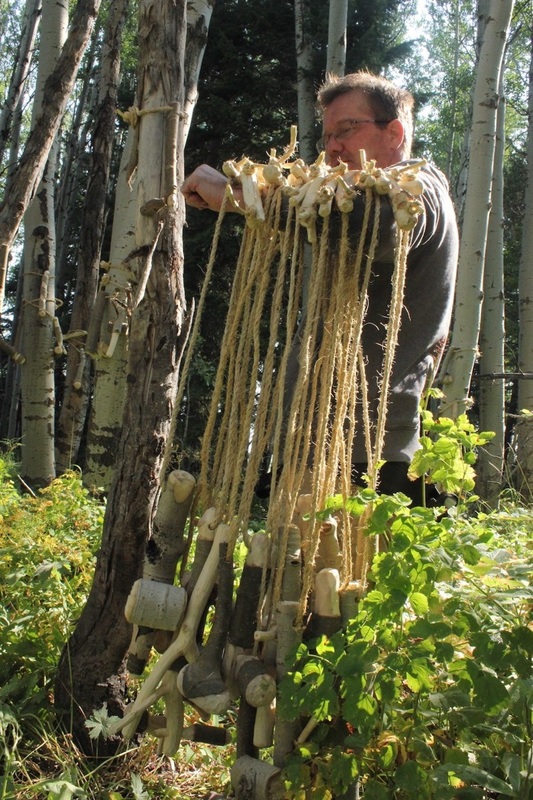 The knockers attach to the aspens, as well as our bodies for transport, by a natural fiber chord. 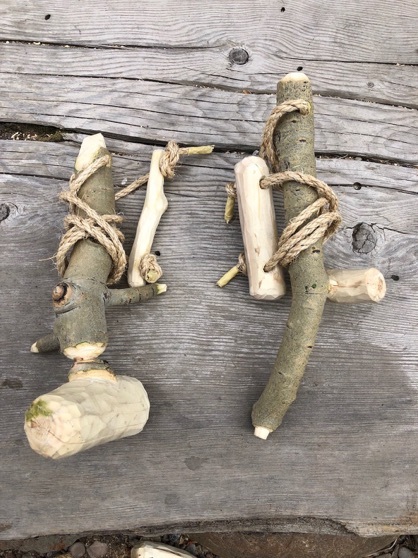 They aim to bring a component of curiosity to a visitor’s encounter, inciting people to enter and explore the woods - encouraging the appearance of others. Stumbling upon something out of place provides the potential for invention. Our project is about getting out of the habit of representation, i.e. depicting the Centennial Valley with a didactic feel-good slant, and instead aimed at inventing a new way of accessing it. Although the audience might look at the knocker as the main component of the project, it’s not; rather, it’s the dance, it’s the tool, it’s the binder, it’s the joint of articulation, it’s that point where accessing the familiar becomes accessing the strange that’s significant. It goes back to the notion of uncanny space that simultaneously contains both the strange and the familiar. When knocking, one is asking for permission to enter. There’s a certain etiquette and respect, but there’s also an announcement of one’s arrival. 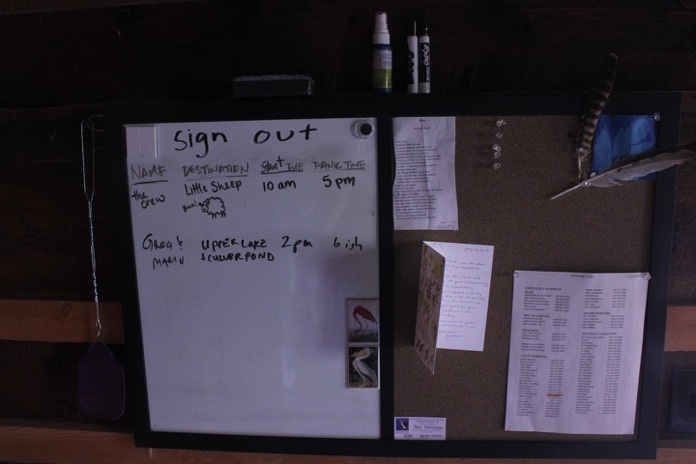 The notion of knocking, of asking permission to enter, is a gesture - art has often been associated with a gesture.